Runners get going in the 2017 Beijing Marathon at Tian'anmen Square on Sunday. Some 30,000 took part. Although dominated by foreign athletes on the podium, the 2017 Beijing Marathon proved a victory on Sunday for mass fitness in China highlighted by rising enthusiasm and better event management, observers said. African runners dominated the 37th Beijing Marathon of 42.195 kilometers from the start at the landmark Tian'anmen Square. Salah Bounasr of Morocco led the men's group in two hours 11 minutes and 18 seconds. Ethiopian Melesech Beyene finished first in the women's group in 2:27:44. However, the roaring public passion in long-distance running, underlined by the sharp increase in the number of applicants to participate in the high-profile race, has made headlines against the backdrop of urban Chinese embracing sporting exercise as a lifestyle. In all, 98,687 runners applied for the 30,000 places in the race this year, up 48 percent year-on-year. This led to an online lottery to decide who would earn admission to run the race, according to China Olympic Road Running Co, the organizer. Photos and race experiences posted by successful participants with the hashtag #Beijing Marathon# on Sina Weibo, China's Twitter-like service, attracted more than 1 billion views hours after the race. "The Beijing Marathon has become a social phenomenon larger than just a race in recent years thanks to the growing awareness of mass fitness and the promotional effect on social media platforms," said Wang Jian, general manager of China Olympic Road Running Co. 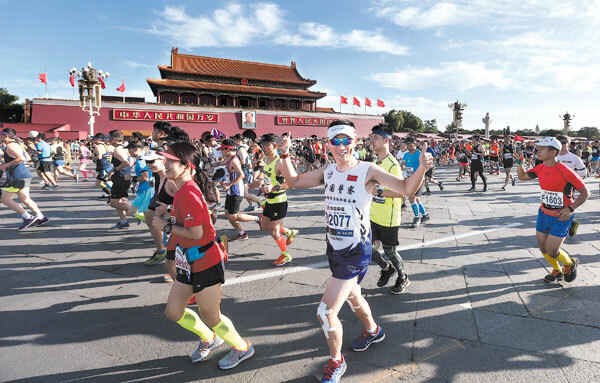 Better service and support for runners coupled with the unique cultural attraction of the Chinese capital has been the selling point for the Beijing race, Wang said. Organizers set 16 medical service stations along the course with 150 medical professionals and 28 ambulances on standby to offer timely treatment if necessary. In addition, 50 specially trained medical staff members also participated at different sections of the race to provide patrolling support. About 420,000 bottles of drinking water, 60,000 bananas and 160,000 energy bars were prepared at supply booths along the course to provide runners with refreshments. "Obviously, the experience of racing at the Beijing Marathon has been improving gradually. I think it's worthy of the reputation of China's national marathon," said Tan Jie, an experienced runner and publisher of Front Runner, a popular running magazine. 2017 Beijing Marathon proved a victory on Sunday for mass fitness in China.